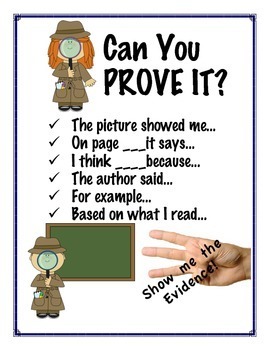 This is a poster I put in my students' binders as a reminder for them and their parents of how I want questions answered (by citing evidence from the text). I put it in a sheet protector. In my classroom, we use 3 fingers held up sideways as a reminder to show evidence or as a celebration when a child shows evidence without being prompted.